Macedonia is a financially stable country in Eastern Europe with one of the easiest company formation processes in the world. In addition, Macedonia’s excellent trade climate allows for great access to most European markets and low tax rates make investment desirable. However, Macedonia’s growth has been consistently stable, but never exceptional, with only a few industries showing substantial growth. Thus, Macedonia is recommended for any entrepreneur looking for a safe place to invest with the potential for moderate growth. Since 2003, Healy Consultants Group PLC has assisted our Clients with business registration in Macedonia. Our services include i) Macedonia company incorporation ii) government license registration iii) corporate bank account opening in Macedonia iv) employee recruitment v) visa strategies and vi) office rental solutions in Macedonia. Macedonia has proven to be of strategic and competitive importance to foreign entrepreneurs willing to invest in the automotive industry. This is majorly due to the i) excellent geographical position of the country giving it access to a huge consumer market of more than 650 million people in Europe, Russia, Turkey and Africa; ii) affordable and skilled labour force; iii) access to the tax incentives offered by the free zones; and iv) low operating costs for manufacturing of auto-components. Macedonia could not qualify to be a part of the European Union (EU) or the NATO and benefit from its various tax treaties and incentive programs due to EU’s partnership with other nations. The reason is the age-old dispute with Greece regarding the name of the nation. 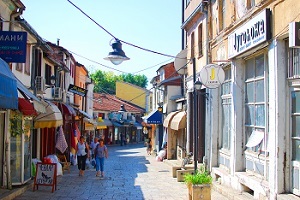 Macedonia is an ideal location to set up either i) a Holding Company, ii) a Logistics Company or iii) a Trading Company as the government offers incentives such as i) 10 years’ tax holidays for companies carrying out business in industrial development zones ii) reduced tax base for profits reinvested in tangible assets used to expand the business in Macedonia iii) free repatriation of profits and dividends and iv) VAT exemptions on supplies purchased for use within the country. To help us engineer the optimum Macedonia corporate structure, please complete the 3-minute questionnaire below; then press the submit button below.